As my mother tried to prepare me a gluten free dish for Christmas dinner, we kept running into obstacles. Worcestershire Sauce? Iffy. Cocktail sauce? Also potentially hiding gluten. She was making a potato dish too, and needed to know about potential gluten in spices. I went googling and found some useful information about Zatarain's -- and by useful I mean they don't list potential gluten in their spices. Instead of Zatarain's my mother turned to Emeril's Southwest Essence. 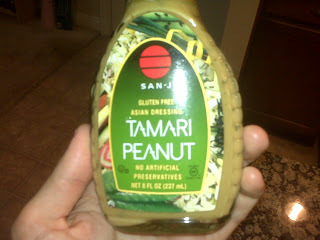 Luckily B & G Foods, the distributor of Emeril's Essence line, has a great list of their gluten free products. Whenever I travel home for the holidays, I'm shocked by the amount of gluten free food available in my small hometown. The Celiac support group here is extremely active and has made enormous strides in making gluten free food available for those who keep a gluten free diet. For a small, rural town, there is an inordinate amount of gluten free options. It makes it much easier to stomach the snow and cold when I know I'll be plied with all sorts of gluten free treats. The latest gluten free offering in my hometown is pizza. Gluten free pizza seems to be all the rage these days, with Pizza Fusion, ZPizza, Deano's Gourmet Pizza, Fresh Brothers, Lucifer's, and Garlic Jim's all offering gluten free pizza in L.A. Unfortunately, prior to O'Scugnizzo's gluten free offering, my hometown was severely lacking in comparable options. 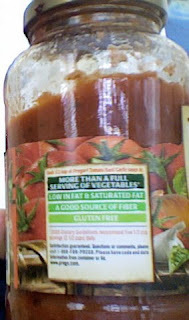 With the addition of O'Scugnizzo's, however, my hometown has stepped onto the gluten free playing field in a big way. I won't go as far as saying that the pizza is up to the high bar set by my favorites in L.A. (here's looking at you, Fresh Brothers and Deano's); nonetheless, it's a great option for pizza if you're in upstate New York. The pizza my look strange to those of you not initiated to the cult of O'Scugnizzo's, but they always make their pizza with the cheese directly on the crust with the sauce on top. 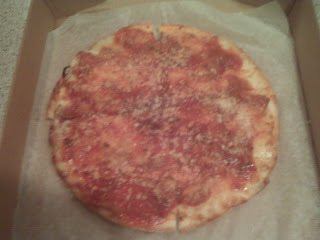 The crust isn't made in house but is instead made by a local company and shipped to O'Scugnizzo's. The above size is the only size available in the gluten free crust. It's definitely more of a personal pizza than a family pizza -- there were only 4 slices. The gluten free pizza costs $7.95, a bargain compared to ZPizza and Pizza Fusion. 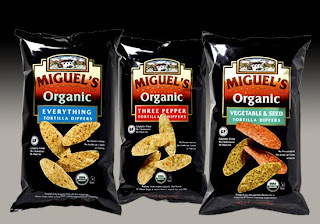 Of course, those two chains exclusively use organic ingredients whereas I'm certain O'Scugnizzo's does not. All in all, O'Scugnizzo's offers a great gluten free pizza for those of you in, or traveling through, the upstate New York region. Whenever I come home I'm guaranteed to be force fed the latest gluten free recipes that my mother and sister have found. My latest trip has been no exception to that general rule. I finally arrived home after three cancelled flights and a 1.5 hour delay through Atlanta back home to upstate New York to a plate full of gluten free cookies. The local time was 3 a.m. but that didn't stop me from indulging in a few of these delectable pastries. 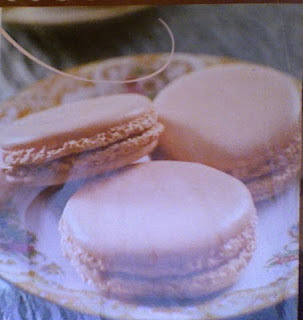 I particularly enjoyed the Strawberry Macarons my mother made me, and have reproduced the recipe below. The cookies were flavorful, light, and very simple to make. The recipe comes from TeaTime Magazine's March/April 2008 issue. Unfortunately I don't have any photos of the cookies; I turn into a cookie monster when I'm home and had eaten all of these before I thought to photograph them. Whoops. The picture above is from the magazine. 1. Preheat oven to 300 degrees. Line baking sheets with parchment paper. 2. Sift confectioners' sugar into a medium bowl. Blend in almond flour. 3. In a large bowl, and using an electric mixer at medium speed, beat egg whites until foamy; add salt. Slowly add sugar; blend until soft peaks form. Add vanilla extract and food coloring, being careful not to overmix. 4. Gently fold the almond flour mixture into the egg whites until just incorporated. Do not overmix. 5. Gently fill pastry bag with mixture (no tip is necessary). Pipe batter into 1- to 1.25-inch rounds on prepared baking sheets. 6. Bake until bottoms of cookies are just set and tops are only slightly firm, about 20 minutes. Do not overbake. 7. Remove parchment sheets from baking sheets immediately after removing from the oven. Allow cookies to cool completely on parchment sheets. 8. When completely cool, spread a thick layer of Strawberry Cream Cheese Filling (see below) on the flat bottom of a cookie. Sandwich with a second cookie; repeat with remaining cookies. Reserve remaining filling for another use, if desired. If possible, prepare cookies one day before serving to allow Strawberry Cream Cheese Filling to fully set. In a large bowl and using an electric mixer on medium-high speed, beat cream cheese and butter until light and fluffy. Sift confectioners' sugar into mixture. Add vanilla extract and preserves; blend until smooth. On my way to the library today (finals are the best!) I stopped by the Eat My Blog Charity Bake Sale in West Hollywood. There was an impressive spread of baked goods out at Zeke's Smokehouse, but I had my eye on the prize -- the gluten free Peanut Butter Chocolate Cupcakes I had seen in the bake sale's advertising. I was fortunate enough to pick up the last one. This cupcake was AMAZING. Words can't even describe how rich and decadent it was, particularly the frosting. Luckily, the baker attached her website to the cupcake so when I arrived to the library I was able to find the recipe. The recipe is included below -- thanks to L.A. Easy Meals for the simple and delicious gluten free recipe! 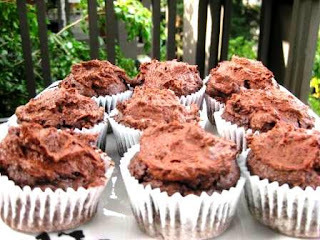 Instead of using the Whole Foods mix she uses, try it with Betty Crocker's Gluten Free mixes! This dessert is really too good to be true. The cupcake itself isn’t sweet at all, I don’t even know if it would be worth eating if it weren’t for the frosting. Although the frosting may taste very decadent, all the ingredients are very low in calories. I’m usually not big on using cake mixes because of all the unnatural ingredients in them, but you can go to Whole Foods and pick up a standard box of organic Devil’s Cake mix. This is also a super simple recipe to whip up for the holidays. In a large bowl, combine the cake mix, water, eggs, applesauce and peanut butter. Beat on low speed for 30 seconds. Beat on medium speed for 2 minutes. Transfer to a 13-in. x 9-in. baking dish coated with cooking spray. Bake at 350° for 30-35 minutes or until a toothpick inserted near the center comes out clean. Cool on a wire rack. For frosting, in a small bowl, whisk milk and pudding mix for 1 minute. In a small bowl, beat cream cheese and peanut butter until smooth.